Get closer to low voltage halogen spotlights than ever before with the MR16 6w COB. You can swap these over with your current 50w fittings and make savings of up to 90% on your lighting bills. You can also make savings on your order before we dispatch the items with our 5% multi buy discount on any orders of 5 or more. Want even more money off? We have a wide range of discount codes with savings of up to 20% for use with our full range of mains and low voltage LED spotlights. You can make a 25% saving before you have even received your order. This product features one large COB LED. Alongside its multifaceted reflector, the 6w COB can emit a beam angle of 60°. The evolution from SMD to COB spotlights has made LEDs a closer replacement than ever before. The 400 Lumen brightness makes the 6w COB a close replacement to 50w halogen spotlights, whilst having two colours to suit more situations than any 50w halogen spotlight before. One of the available colours, Warm White, has a light colour of 3000K which makes it the perfect replacement for any spotlights in your bedroom or living rooms as well as rooms that have a more traditional decor as the Warm Colour suits the style of the room very well. The other available colour is Cool White and is 6000K. The bright, White light emitted from Cool White is mainly used in rooms that need more light such as bathrooms and kitchens. Cool White is also used in rooms that have a modern decor to them. Like all of our MR16 LED spotlights, the 6w COBs are available to be dimmed with the right equipment. If you have a compatible LED dimmer switch and dimmable LED driver, then you can dim low voltage LED spotlights exactly like traditional ones. Each 6w COB has a life expectancy of up to 50,000 hours meaning you can expect up to 15 years worth of life and even more if you were to dim them. Along with all of our Mirrorstone LED spotlights, LED light bulbs and LED tape the 6w COB has a 2 year warranty as standard. This warranty has the option of being upgraded to 5 years, free of charge! 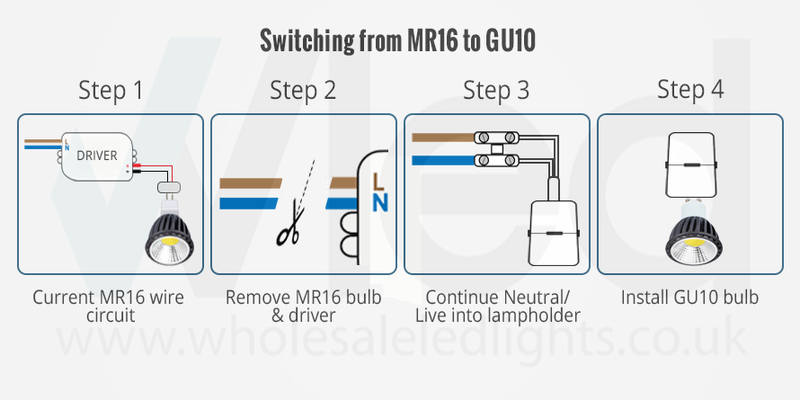 If you have any queries about MR16 LED bulbs, dimming option or you're in the trade then get in contact with us by telephone on 0116 321 4120 or e-mail one of our friendly customer service team at cs@wled.co.uk. Good service lamp does the job. Great light a beam spread. Much better than cheaper alternatives for a bathroom. The extra wattage over the usual 4w bulbs has make a tremendous difference to a bathroom with no windows. It's much brighter now. Great price and great quality. Couldn't ask for more! Thank you for the recommendation Neil! Replacement for warm white Lamps in a studio. Excellent light at a great price.